If you follow any of my social media accounts, you likely are aware of the fact that I hate it when it's hot. At the time of this writing, we have an excessive heat warning in Southern Utah for temps over 110F. I'm not a fan. So I've been reminiscing over winter weddings and brewing my fill of cool coffee beverages. We've discussed the slow steeped cold brew, but what if you need your coffee now? Or perhaps you just think cold brew lacks the pizzaz you love from hot coffee. 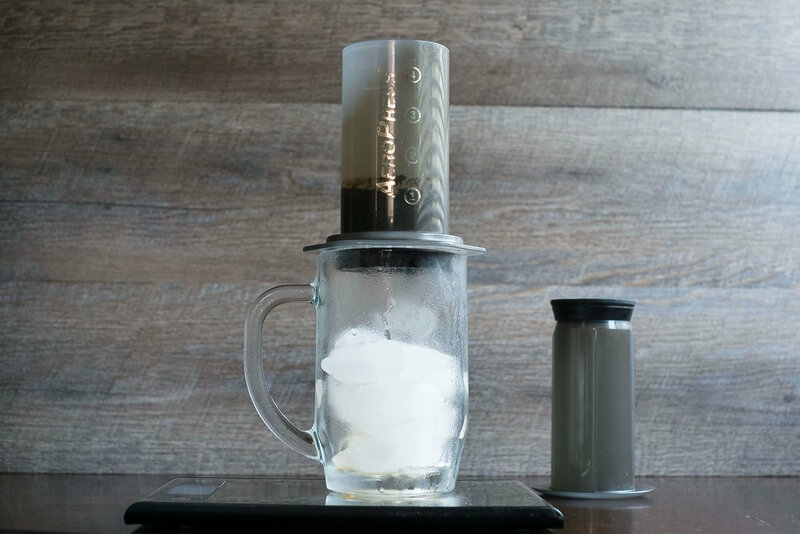 Enter the Japanese-styled iced pour over and Aeropress. After my initial discovery and obsession with cold brew a couple years ago, I evangelized cold brew as the only way to make good iced coffee. As it turns out, I was wrong. A barista and good friend of mine introduced me to the concept of the Japanese-style iced pour over. I don't honestly know why it's referred to as the Japanese method. I can only assume it originated in Japan, but so far I have been unable to track down the source. So if you know something about the origin, shoot it my way! As we discussed in the Cold Brew Recipe post, cooling coffee requires leaping a couple of scientific hurdles. Volatility and oxidization, in particular, make cooling coffee a particularly delicate process. Volatility refers to the ability of a substance to turn into gas and vapor while oxidization refers to the chemical change that happens to coffee oils when they bind with oxygen, creating sour or stale flavors. Both of these processes occur much quicker at the high temperatures used to brew coffee. Cold brew circumvents them by brewing at room temperature or cooler and introducing longer amounts of time to extract the solvents. That circumvention of heat also creates a drawback to the cold brew method. Many of the solvents that contribute to the complex, nuanced flavors of hot coffee also dissolve at high temperatures. So while cold brew creates a smooth, rich brew it lacks acidity and complexity. The Japanese method for iced pour overs takes a different route. The Japanese method seeks to keep the complexity and nuance provided by the volatility while hindering the affects of oxidization. It involves brewing with hot water as usual then flash cooling, or shocking, the coffee. Flash cooling refers to dramatically decreasing the coffee's temperature immediately after brewing. This process locks the aromatics into the coffee and prevents oxidization, keeping the coffee tasting fresh as long as it is cool. When the coffee comes into contact with your mouth, the increase in temperature releases the aromatics. Those aromatics then find their way into your nose via the back of the throat delivering the acidic, floral, and citrus notes. Unlike the smooth, clean aftertaste and mouthfeel from cold brew, the Japanese method has a bright finish similar to that of a cup of hot coffee. I've found that fruity and floral coffees from Ethiopia and Guatemala are particularly well suited to this unique palate experience. To practically accomplish this experience, this method essentially substitutes half of the pour over water with ice in the carafe. Our goal then is to extract the same amount of solvents using half the amount of water, creating a more concentrated solvent. As the ice melts and cools the coffee, it regulates the solution back to our normal ratio. To create that concentrated solvent, we need to use a finer grind to increase the amount of surface area contact between the grounds and the water. 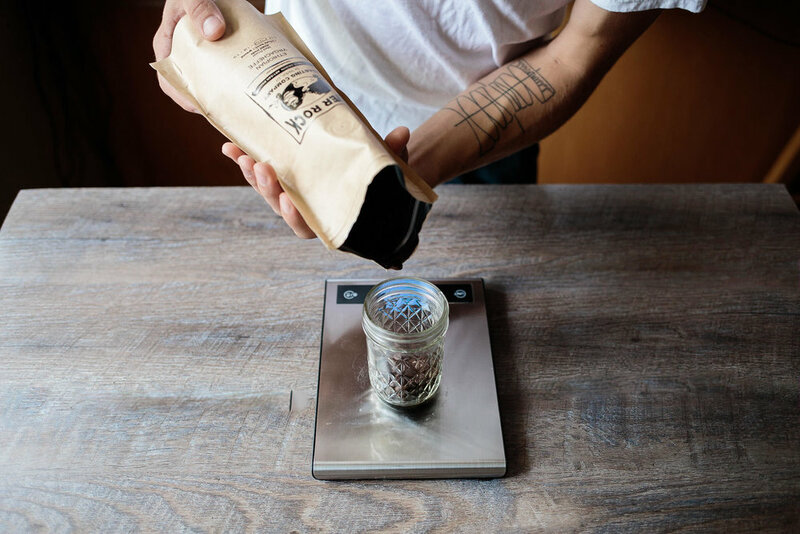 Like the pour over methods we covered last week, this method greatly benefits from the use of a digital scale. I've found that the ice is particularly difficult to account for with volumetric measurements. Do yourself a favor and pick up a scale, you can get an inexpensive one like this. It will really help bring consistency to your brewing and help you step up your coffee game. I typically use my V60 but a wedge or any other pour over device will work just fine*. Begin by weighing out your ice. Get as close to 160g as you can with the cubes. *Personally, I’m not a fan of the Chemed method of iced pour overs. The Chemex requires significantly more rinsing thanks to it’s thicker filters. 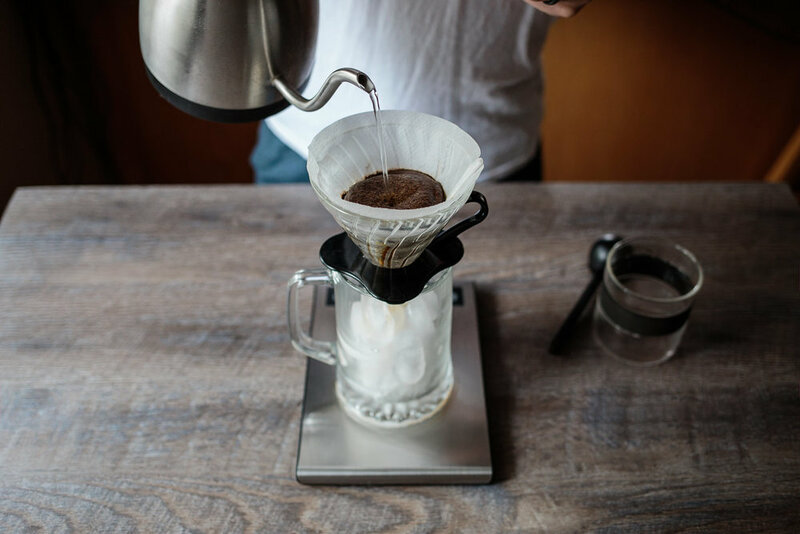 Since the pour over and carafe are all in one with the Chemex, you cannot pre-heat the filter and pour over for proper extraction and also keep the carafe cool to shock the coffee as it’s brewing. To my taste, the Chemex brews an inferior cup of iced coffee. Both the upright and the standard Aeropress styles discussed in this post will work for the Japanese iced method. The upright method does not need to be ground finer thanks to it's full immersion. If you choose to grind finer, use a shorter steeping time. From my experience, the iced method removes much of the variation in flavor between these two methods. As I alluded to in the original cold brew post, some have the opinion that this method is superior to cold brew because of it's complex palate. Personally, I don't think that is the case. The Japanese iced method extracts acidic and aromatic notes like cold brew cannot, however, it doesn't highlight cocoa or nutty notes like cold brew does. Cold coffee always comes with a certain amount of trade offs from it's hot counterpart, neither is superior to the other, just different. They both have their strengths and weaknesses and ought to be appreciated individually. As always, if you have any comments, questions, or suggestions for future posts, leave a comment below or drop me a line over at the contact page!